Huawei has lifted the lid on a brand new device at MWC 2016 in Barcelona, but rather than it being a phone, tablet or even a wearable, the Chinese firm has instead launched a 2-in-1 device. Say hello to the Huawei MateBook. Company CEO Richard Yu explained how he wanted to replace his heavy, bulky laptop with its poor display and battery life - which is where the Huawei MateBook comes in. 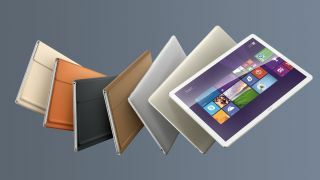 In short, it's a direct rival to the likes of the Microsoft Surface Pro 4 and iPad Pro. The MateBook runs Windows 10 and is powered by a sixth generation Intel Core M-series processor (you can choose from M3, M5 or M7) and either 4GB or 8GB of RAM. There's also a selection of solid state storage options too, with 128GB, 256GB and 512GB up for grabs - but the larger you go, the more you'll pay. A 12-inch 2160 x 1440 QHD display and 4430mAh battery are crammed into the slimline 6.9mm thick, 640g all metal body, and the tablet can magnetise to Huawei's keyboard case to make it into a laptop. Huawei claims you'll get 10 hours from that battery on a single charge - although that remains to be seen. The MateBook starts at US$699 (around £480, AU$980), although you can spend a lot more depending on the configuration you select with the most expensive option topping out at US$1,599 (around £1,100, AU$2,240). And that's just for the tablet section. If you want to accessorise with the keyboard, MatePen stylus (which also functions as a laser pointer and presentation clicker) or the MateDock (offering HDMI, VGA, Ethernet and USB ports for the MateBook) then you'll need to part with an additional US$129, US$59 and US$89 respectively. The MateBook is definitely bucking Huawei's trend of producing lower cost rivals to big name brands. There's no firm MateBook release date just yet, with Huawei saying it'll be available in Asia, Europe and North America "in the coming months."